As you know, it is very difficult to decorate your home in MC:PE. This is due to the fact that the game contains very few items that really decorate the home, such as furniture or electronics. Ultimately, you can create a similar chairs and a table with the help of planks and ladders, it anyway will not look so beautiful. Forget about it, because now addons add some decorative elements that have a realistic texture and can be used for their intended purpose. Modern Furniture is 9 new items for easy decoration of your home. 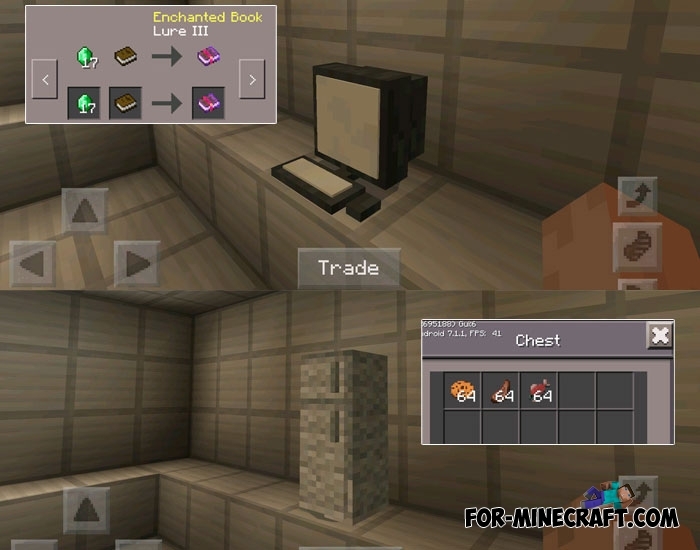 Works on Minecraft PE 1.2. How to install the Modern Furniture addon? Download the archive and unzip it using any file manager. These files must be activated in the settings of the game (global resources). There are some electrical items such as a computer, a refrigerator and electric stove. Of course, they do not consume electricity but perform certain functions. The computer is used as an online store. Here you can buy items that can also be bought from the villagers. Place the computer on a table and sit down on a chair. Perhaps development level of addons will allow to use a browser right in the game like some mods. Refrigerator is the place where you can store absolutely any thing. This is a full copy of a chest, but looking the other way. Refrigerator occupies only two blocks in height and can be placed as a chest. 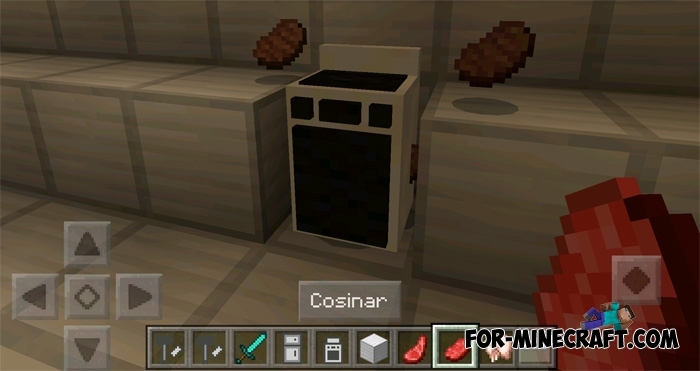 Using the stove it is possible to cook any meat as before. If you have a kitchen then this is a great appliance like a refrigerator. 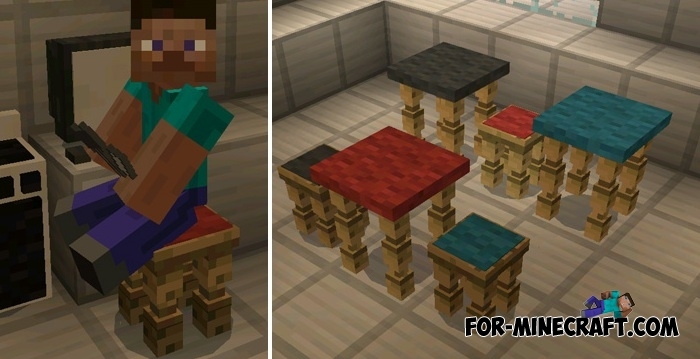 Also, the Modern Furniture addon contains colored chairs and tables, and an anvil, which throws out a random item in exchange for coal. Chairs and tables can be placed on any surface and have an excellent feature. Go to the chair and just sit on it. The position of your character is quite realistic and does not cause bugs. A trashcan is an integral part of any kitchen. Place it in a convenient place and throw out unnecessary rubbish. 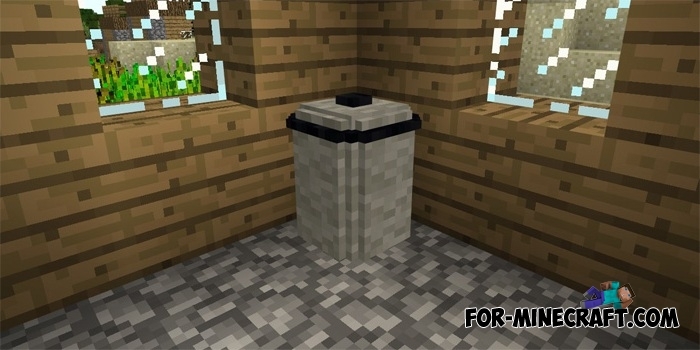 Carefully, the trash can removes objects that are inside and you can not return the discarded items. The postman is an updated villager who delivers goods purchased at an online store. Talk to him to place an order and receive the item. Try out the new four-poster beds, these are very comfortable and at the same time attractive places for sleep. All beds are the same except for the color. I am having high hopes so I hope this will work. I also want more things added to this website like mods Addons ect.